The traveling exhibition will call upon NHMLA for nine nifty months. 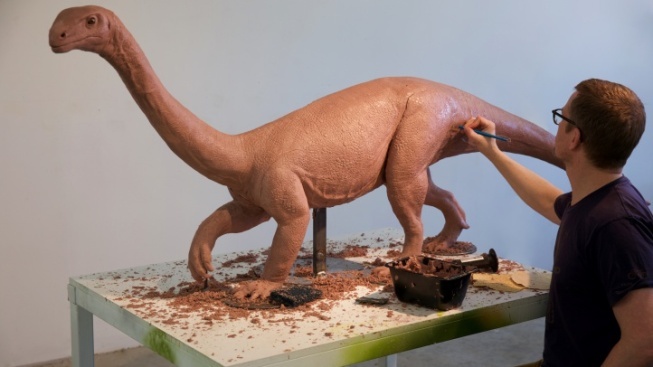 Spy a wealth of information, models, and more when the dino-sized show stomps into the Exposition Park museum, beginning on April 3, 2019. Pictured: A model of a Sauropodomorph. We say "Antarctic animals," you call out "penguins!" We again say "Antarctic animals" and you break out your best penguin impression, walk like a penguin, stand like a penguin. Penguin people, and that's probably all of us, can be forgiven for immediately associating Antarctica with the tuxedo-terrific birds, those stunning, ocean-diving superstars of the avian world. But long ago, the southernmost area of our planet wasn't a vast world of ice, but rather a "lush, temperate pre-historic environment where crocodile-sized amphibians and elephant-sized dinosaurs once roamed." And also mega? Those dinosaurs will soon visit the Natural History Museum of Los Angeles, at least through drawings, models, and a host of way-cool, info-deep displays. After all, these dinos lived millions of years ago, and we currently do not live millions of years ago, making any modern meet-ups rather impossible. But not impossible because of "Antarctic Dinosaurs," the traveling exhibition roaring into the Exposition Park museum on Apr. 3, 2019 for its West Coast debut. It's a large-scale show, with so many cool, learn-a-lot components, and it is ready to nest at NHMLA right into, wait for it, early 2020, on Jan. 6. Prepare to behold "full-sized replicas of four species of dinosaurs," including the Cryolophosaurus (the one rocking the bony crest atop his noggin) and Glacialisaurus (an herbivore described as being as large as an elephant). A pair of "recently discovered" sauropodomorphs will also be in the spotlight. Possibly the coolest-of-the-cool, when it comes to this exhibit? You'll be able to touch real fossils hailing from "lost worlds." Of course, the cool-a-tude doesn't end there, with opportunities to gaze through microscopes and learn more about the work of paleontologists. Stomp, stomp, stomp: That's no penguin headed this way, but some biggies of the scaly prehistoric set, the "Antarctic Dinosaurs" that will beguile and fascinate thousands of dino-devoted Southern Californians, starting in early April 2019. Need more dino-tastic knowledge? Information will be shared soon, on the Natural History Museum site. Rrawr!